← A Common Mistake in Calculating IRA Annuity RMDs – Don’t Go It Alone! Could You Benefit From a Structured Note? A Structured Note is a debt obligation issued by a financial institution which has some similarity to a bond instrument, and/or a growth instrument. 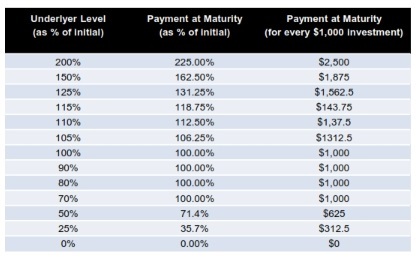 It carries a stated coupon percentage (often times at zero due to appreciation being more desirable than income), and a final maturity date for principal repayment. However, unlike bonds, Structured Notes add additional features which add potential return and reduce downside risk. This is accomplished in two primary ways. First, the performance of the Structured Note is linked to the performance of an underlying asset (called an embedded derivative component) to enhance returns to the upside. One popular example is a Structured Note linked to the performance of a major stock market index such as the Standard & Poor’s 500 (there are many others, such as emerging markets, commodities, single stocks and interest rates, to name a few). This link, and thus the performance of the Note, can further be amplified by adding a leverage factor. This means that for every percentage the S&P 500 index increases, the Structured Note would then increase by a factor more than the index. 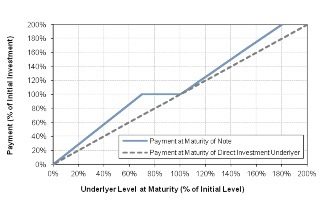 For example, with a 1.25x leverage factor in the terms of the Note, a 10% return of the S&P 500 would increase the Note by 12.5% by the maturity date. This is a favorable premium to the performance of the underlying instrument. Second, in order to minimize the downside risk, the Structured Note can also carry a feature to protect principal if things go against the desired outcome. One example of this would be a buffer, which would protect the investment in the event of a decline in the derivative component of the Structured Note. Therefore, if the same S&P 500 Note was purchased with a 30% buffer level, the first 30% decline in the index would be “free” to the Note holder if held to maturity. The Note would show a loss on paper during the life of the Note while the S&P 500 is down from the initial starting point. However, if held to maturity, the holder would receive the original beginning principal amount and experience zero loss. Manchester believes that Structured Notes can provide a valuable enhancement to managing portfolios for clients. Stay tuned for further articles on Structured Notes. Mark Weiderman is the Portfolio Manager for Manchester Financial, an Investment Counsel/Wealth Management firm located in Westlake Village. For more information call 800-492-1107. This entry was posted in Financial Planning and tagged Structured Notes. Bookmark the permalink.